Check out our LJ 1’s, Pod’s and Nook’s! Formerly St. Peters Church is now Vught’s local library. New functions create new spatial awareness. The additional floor is a striking spatial element that brings a spectacular perspective on the church. Resulting in a fresh look that pays homage to its past. FULL NODE is a collaborative work space for innovative blockchain companies. This community believes information should be shared, continually reconciled, and truly public. 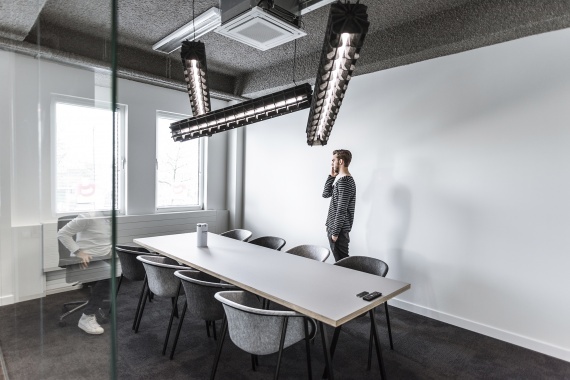 Reflecting this philosophy, LXSY Architects designed a non-hierarchal workspace that lets everyone easily connect, share information, exchange ideas, and closely collaborate. 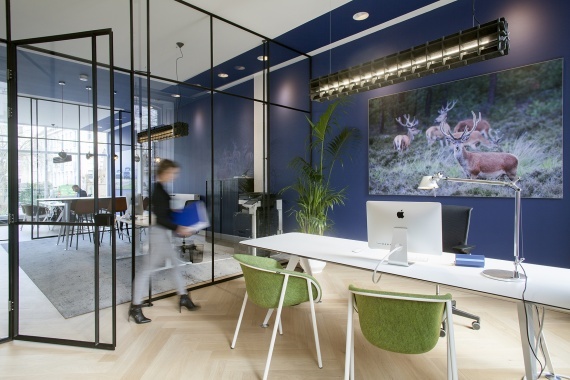 Studio Bogaarts made a design to transform the office of the real estate company PZD in Arnhem. They selected De Vorm products because of their simple and honest expression. A clear language of form and use of material. The finished result is a modern space that utilizes clean lines and bright colours. An urban jungle look and feel. 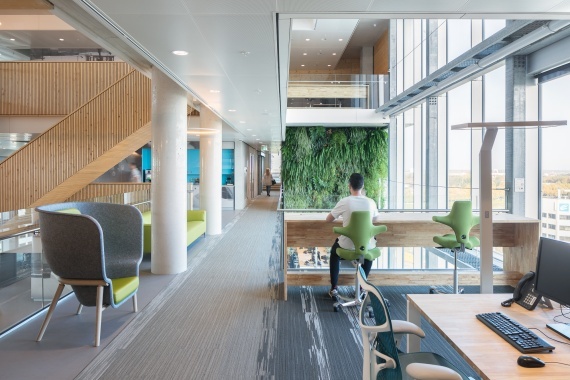 Kraaijvanger Architects and CIC’s designteam expanded the Cambridge Innovation Center with its key objective to maximize the use of circular materials. De Vorm's PET Felt Nook Lounge Chair’s and LJ 2’s align perfectly. 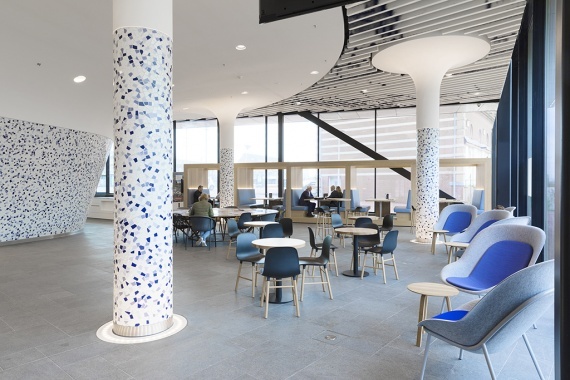 Located between two rivers, Rabobank Druten asked Quub to adapt the local scenario in their design. To do so, they created a blue zone that flows through the building and connects all parts of the interior. Because of De Vorm’s wide variety of customization possibilities, our Pod’s and LJ’s could be seamlessly integrated with this colour scheme. Strategisk Arkitektur established balance between transparency and privacy for the Tele-2 interior design in Oslo. 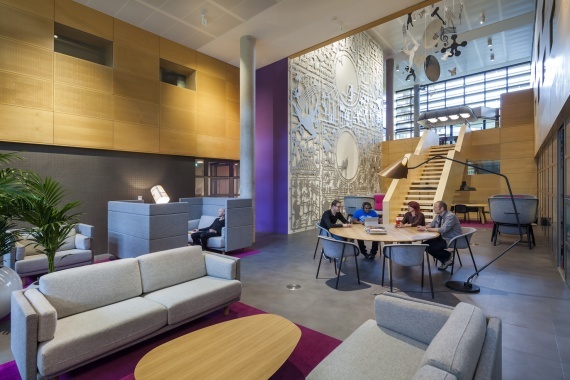 The building has been transformed into an open, dynamic and collaborative environment. 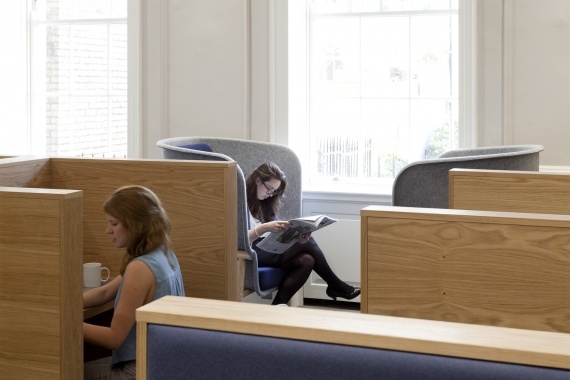 The office floors are connected through our Pod Chairs, allowing for connectivity, privacy and intimacy. Following the company’s vision, WIES created an interior design where flexibility is key. 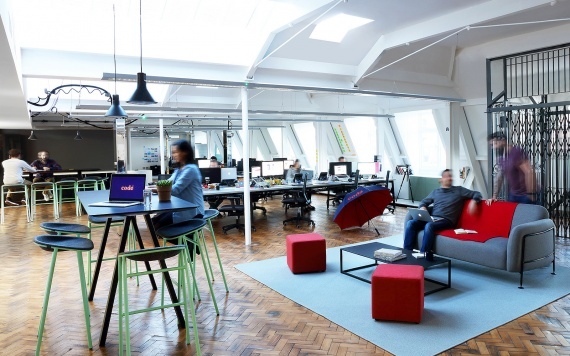 A variety of spaces for different types of working. De Vorm’s products are able to meet this diversity yet still create unity. The LTO (Agriculture and Horticulure Organization) is an employers' and workers' association in the Hague, the Netherlands. It represents nearly 50,000 agricultural entrepreneurs and upholds their economic and social position. Sustainability was key in the design concept from Studio Biek for Delft’s new city hall. Our PET Felt furniture matched this objective perfectly. 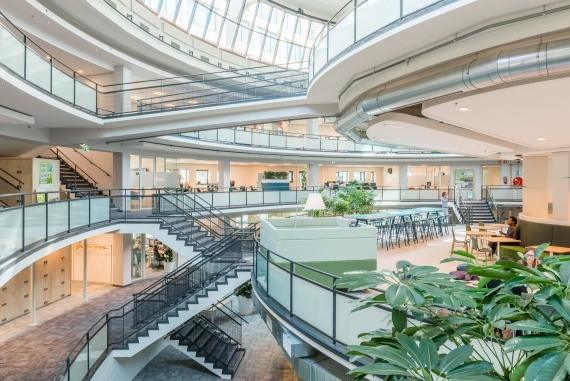 Former headquarters of Ahold just transformed into a premium office facility. Where corporate approach meets classic lounge. Upon entering, you're invited by De Vorm's sofa's and Pod chairs, which are the cosy nooks within the large open spaces. The rounded shapes of 2 Cups Bar surprises instantly. 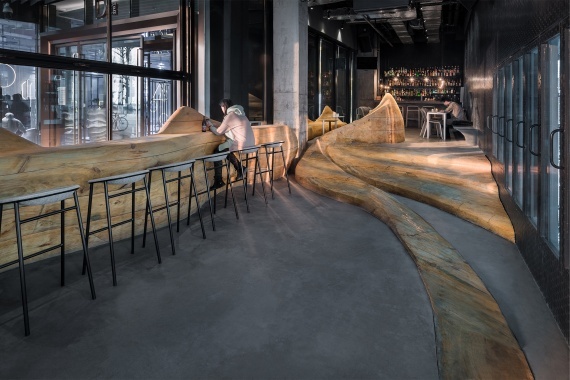 The bar reveals itself within a wooden landscape, simulating the mountainous surroundings of the city of Chongqing. Soft PET Felt furniture plays a subtle role next to the outspoken wooden elements. 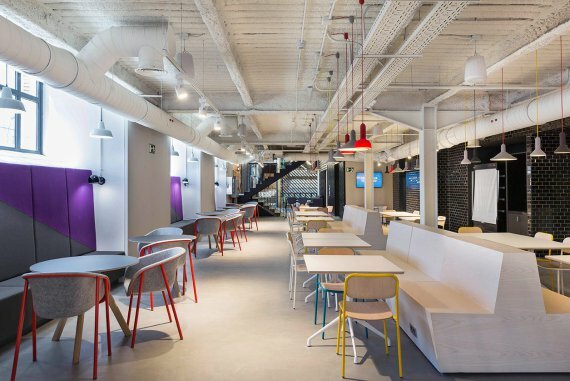 Nike's European HQ Eat & Meet area is based on innovation and tradition. An interior that seemlessly suits the company's identity. No wonder that the creative team of interior design firm Workshop of Wonders chose the price winning chairs from the LJ Series. The Venlo City Hall is an Architzer A+Award winning design, based on the principles of Cradle to Cradle. 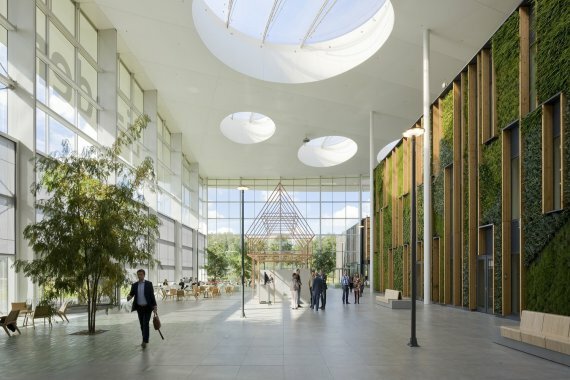 Kraaijvanger Architects combined comfortable and healthy working environments with sustainable innovation. Our Privacy Chair - Pod - fits in perfectly within this Cradle to Cradle vision. 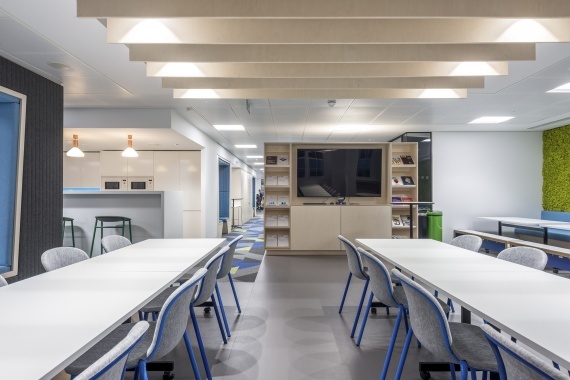 The original design concepts– creating an open work environment and encouraging collaboration and casual interaction– were so successful that Horizon challenged A+I to push it further. 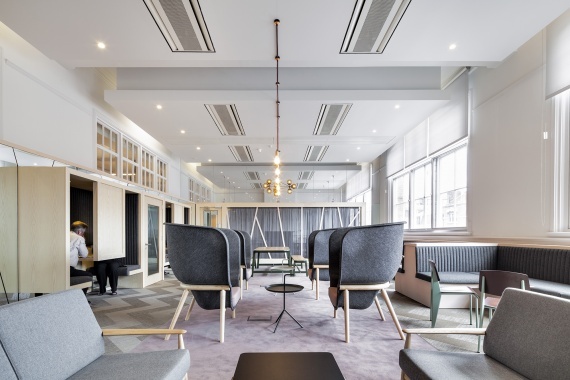 Our Arnhem Sofas enabled their designers to create a tailor-made solution for their third expansion in downtown Manhattan. 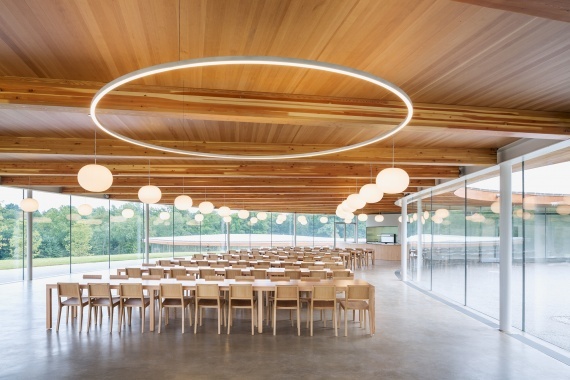 The holistic River Building is nestled into the rolling landscape of Grace Farms. SANAA designed a venue to foster a sense of community and place. Natural Wood Me chairs by De Vorm contribute to this harmonic balance. Restaurant PONG has opened its doors in the heart of Düsseldorf's Museum for Pop Culture. Located in the strict 1920's building, it is a place that bridges the gap between the past and present, the traditional and the experimental. Discover De Vorm's nowadays furniture in the elegant and historic place. Jump Studios did a great job tranforming a 19th-century battery factory into the latest Google Campus. 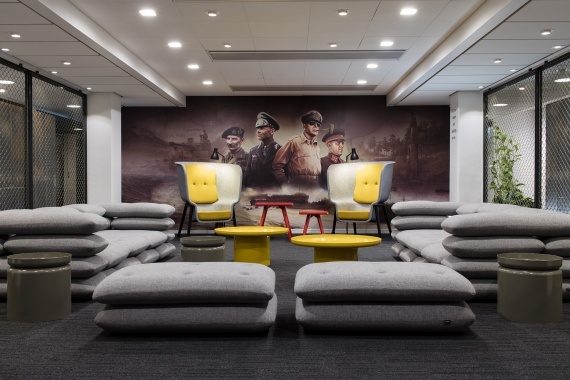 A co-working space where history merges with a contemporary style. Google houses over 7,000 members and 50 start-ups. 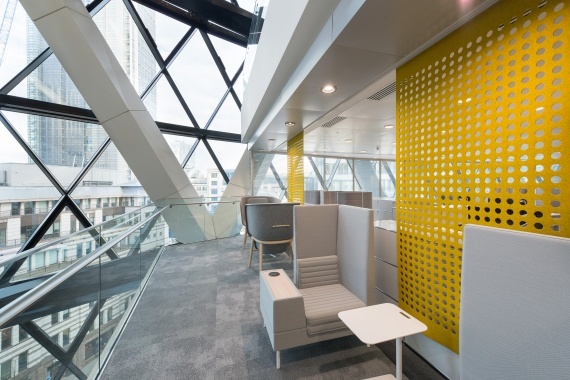 A colourful array of LJ 1 chairs are splashed throughout the building. 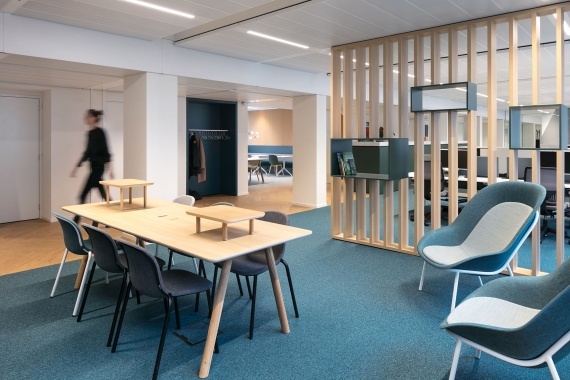 Following a clear concept for the organization of the interior design, Fokkema & Partners have created a work environment that connects high-technology building processes within a warm and friendly appearence. 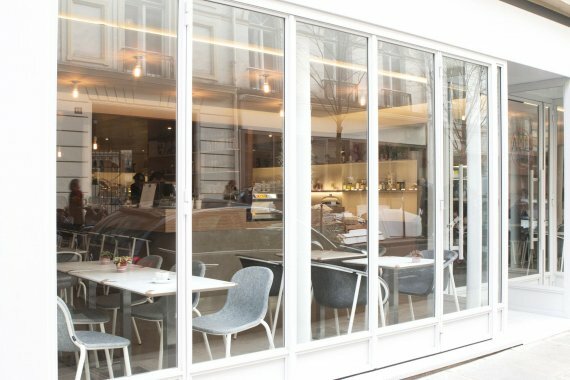 Organised around a vibrant patisserie kitchen, the interior of Lifestyle shop Sans Pere is personal and inviting. The Olive coloured Mute Acoustic Panels blend in beautifully within the colour pallette that takes cues from the French Riviera landscape. 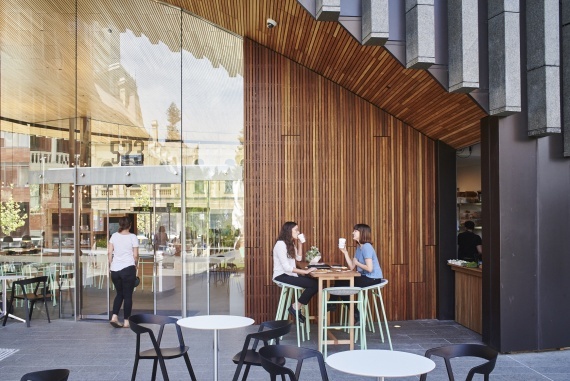 The sparkly new hole-in-the-wall café at the City of Perth Library has opened its doors. Located at the historic Cathedral Square, Saint Larry Café ain’t the usual library fare. It’s lively and fun, with reliably good coffee, a simple but punchy menu and some well chosen colours on our LJ chairs. RAU and Fokkema & Partners architects were challanged to create the vision for the new office facility of Liander. The large office building should be seriously conscious in every aspect. The result is amazing: Over 80% of the used materials were recycled from the obsolete existing buildings and reused. This governmental office building has been modernised with an open structure. 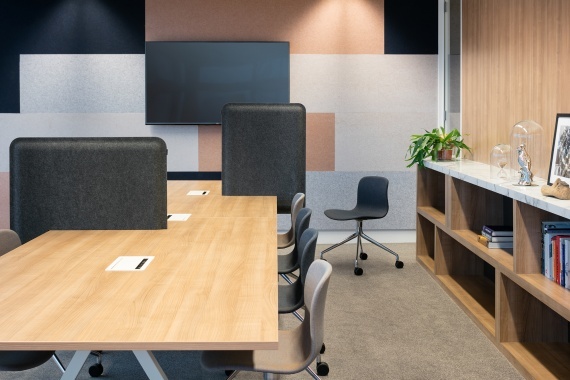 To tackle the acoustic challenges, PET Felt Panels are installed on the walls. A material that decreases sound reverberation and offers the possibility to design custom cut outs to contribute to the corporate identity. 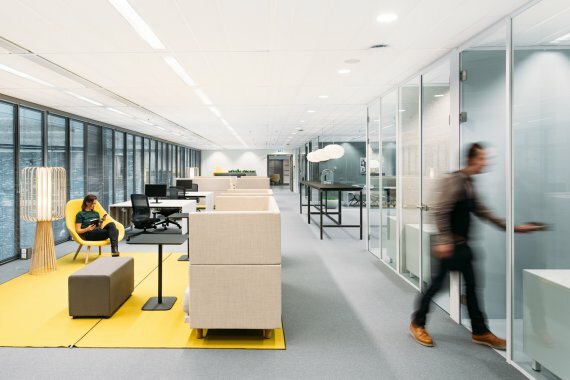 Graphic and functional lines form the newly build office space of IT firm Schouw Automatisering. 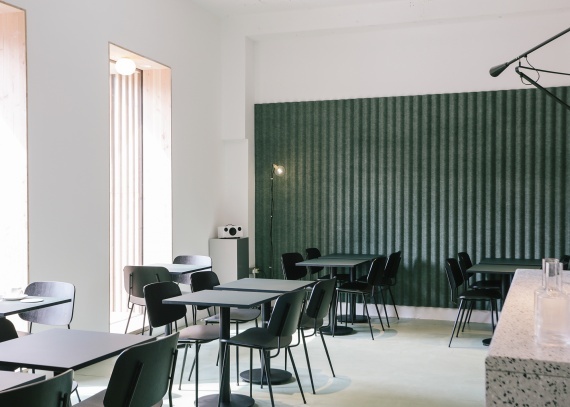 i29 Interior Architects used geometric patterns with PET Felt Panels along large photos and plant walls to create superb acoustics. 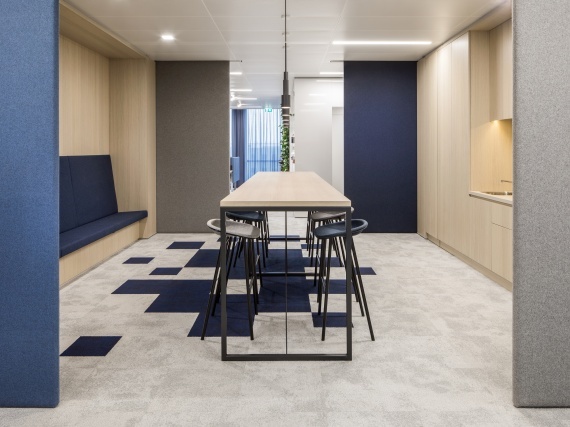 Different functions were added to the renewed Rabobank office in Deurne. 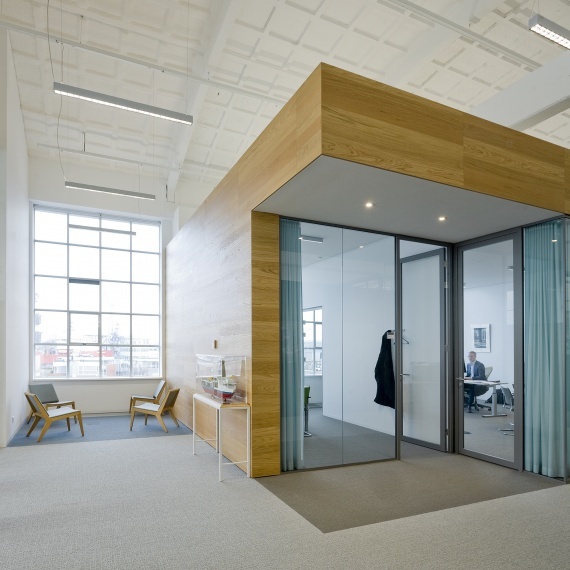 Berix Interior Architects incorporated welcoming spaces to meet, work and wait. It's all included. The broad range of our PET Felt furniture found its way throughout the different setting. At the Office Group you can choose the style of working that best suits your business. The Stratford Place is a wonderful combination of the old and the new. In here our Pod chairs provide privacy and sounddampening within the large Georgian style space. The best place to read or retreat. 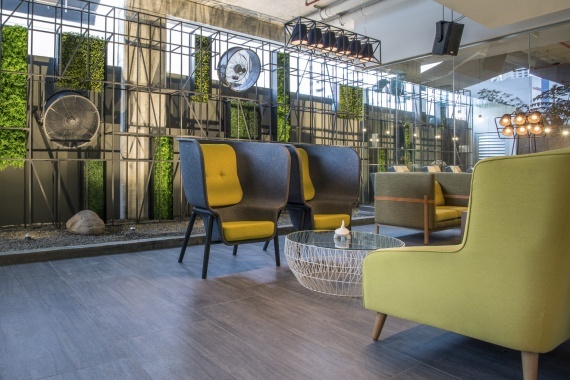 At the Storey’s Flooring showroom, different flooring products are used in creative applications throughout the showroom including the desks and joinery. 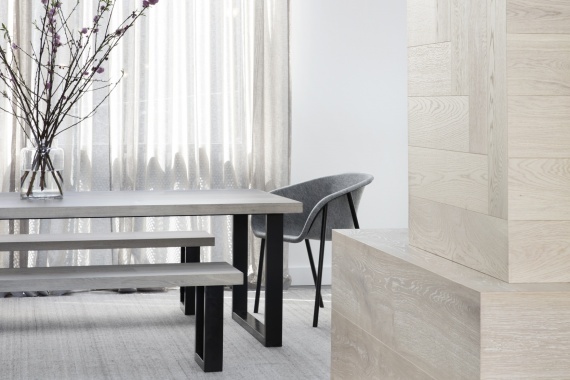 In a room all about flooring, soft PET felt arm chairs play a subtle role. VOID Interior architects really took control of De Vorm's customizable options. Nothing standard here. 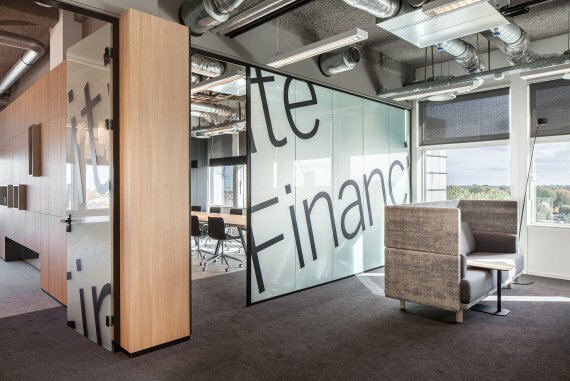 They created a space full of juxtaposing sufaces and materials within their tailor made design for the new Citigate First Financial office in Amsterdam. Ampelmann's energizing character is reflected in their new office. 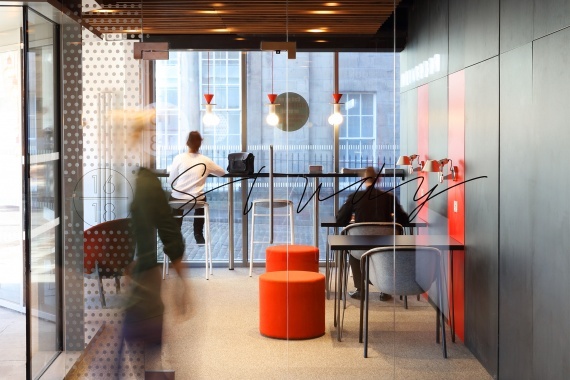 Fokkema & Partners Architects personalised their office with our bespoke LJ 1 chairs. The yellow details are inspired by the company's offshore gangways. DZAP Architects designed a tough, functional and innovative office interior that fits the vibrating setting of its user. By harmonizing materials and colours, the result is an appealing area in which you easily adapt. The furniture provided by De Vorm is highly customizable, just as accordance to the clients needs. At Greenchoice sustainable goals are the basis to all processes. So is their new furniture. Which is upcycled from plastic bottles and thoughtfully produced by De Vorm. Feauturing our Pod and the LJ 3 bar stools. 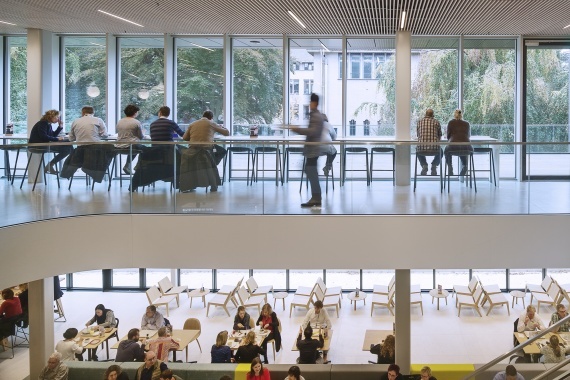 Brightlands is an open innovation community in a global context. They combine science, business and education with a focus on health and sustainability. Their campus offers state of the art facilities to support their users. De Vorm's innovative approach to material aligns perfectly with the clients identity. Aros Architects needed to create an easy transformable office space for diverse use. They wanted stackable but comfortable chairs, preferably not made of plastic. 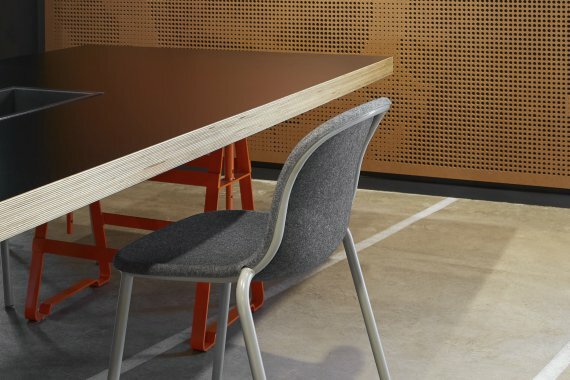 The LJ 2 stack chair was the perfect solution, even though they're made of recycled plastics. PET Felt has a soft and warm look and feel. In the heart of Edinburgh, Jasper Sanders + Partners created multiple flexible spaces. Purposely designed around the students and the management suite staff. De Vorm's PET Felt chairs are used throughout the accodomodation. PET Felt is a strong material that stands up to the rigours of students. Brutto Restaurant in Panama City contains over 2400 square feet of lounge and dining space. The large spaces are decorated with a rich variety of plants, furniture and wall coverings. Pod chairs are there to shield its users from their surrounding while waiting for a table or while enjoying a cocktail in the lounge. Paradox Interactive creates grand strategy computer games with great scenery. Their office is just like that. This fantasty interior merges with the sceneries from their games. A playground full of graphic illustration and striking walls are put together with our PET Felt furniture collection. Pod chairs were a great solution for the open balcony spaces in this iconic office tower. The office workers find shelter from the noise spilled from the different levels above. The Pod chairs are the perfect place for meetings and phone calls while enjoying the stunning view and natural light. After significant restauration and refurbishment, the stunning historic building has a new purpose. On the top floor, Design agency Code Computerlove houses in a vibrant contemporary office space that includes De Vorm's LJ Series. Specifications of a new-build standard were added while original details kept remained. 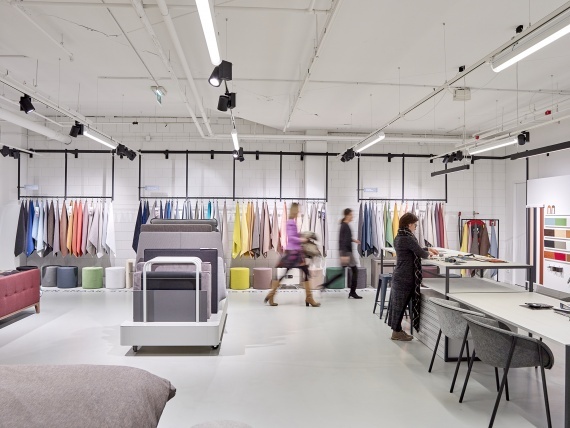 The Auping brand store in Amsterdam isn't just a store. It is an inspiring array of colours, samples and materials. Where customers design their own beds. Seated in one of De Vorm's chairs, customers actualize their choices to create the bed of their dreams. Offshore engineers GustoMSC houses in a former carpentry factory. JHK Architects transformed the industrial building by adding wooden elements to balance its cold looks. De Vorm contributes with Wood Me Lounge Chairs. All furbished in a fabric that perfectly matches with the Maritime colour scheme. 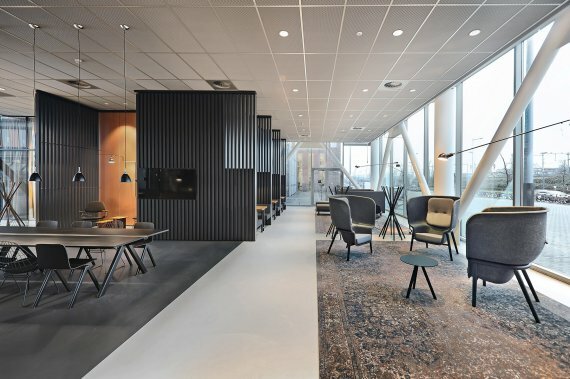 The large editorial staff of Dutch public broadcaster NTR houses in a brand new building. De Vorm contributed with highly customizable products and sustainable furniture for this bold interior. Hip v Hype facilitates a raw but comfortable studio. It houses a multidisciplinary group of design-led professionals. The interior with its concrete floor and rough walls is nicely balanced by using soft PET felt. 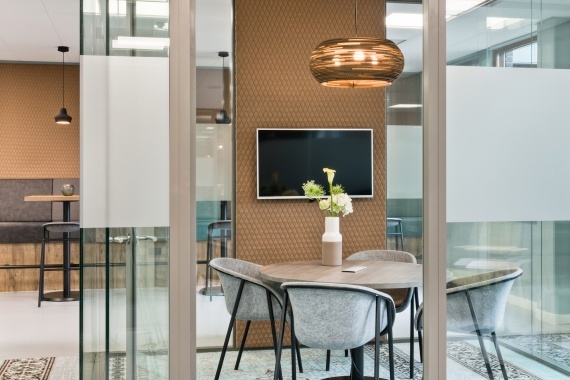 A warm and acoustic solution for ceilings, the cabinet and on our LJ 2 chairs. 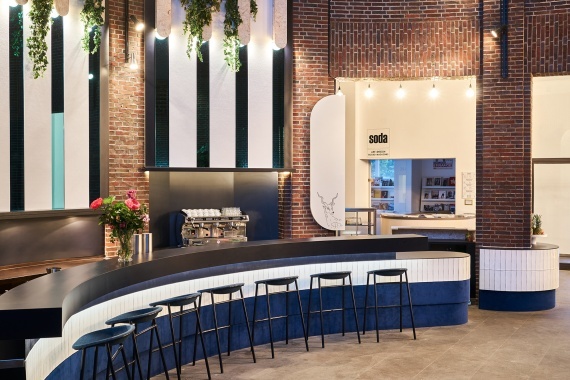 The very first Matcha café has opened its doors right in the heart of Paris. A place like no other. The architect created a subtle and discreet design. In which clear, purified, unostentatious, contemporary and simple furniture aligns perfectly with the spirit of the place. An international consultancy firm expanded into the 10th floor of the UN Studio office tower. They were looking for a soft textured office, both corporate and elegant. Our PET Felt Panels provide the acoustic comfort and desired aesthetics in this welcoming office interior. The Wood and Furniture College in Rotterdam has a brand new school building. Its interior is purposely full of design classics and nowaday's furniture. Including De Vorm's most innovative pieces. We practice what we preach: Our innovative philosophy on furniture making teaches and inspires the students. Mod is more than a Popup co-work space. 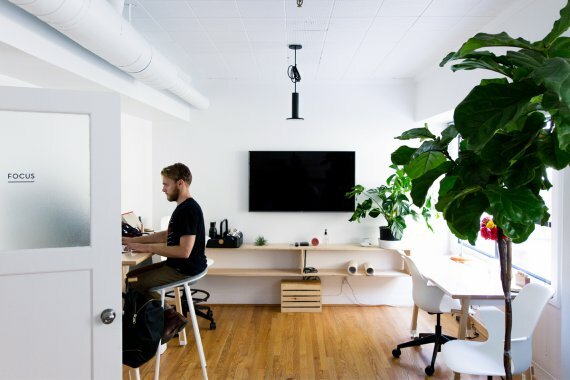 It's the on-demand workspace that brings hospitality and wellness to the workday. They want you to love the way you work. De Vorm's furniture made of recycled PET bottles blends in perfectly with their vibrant and concious vibe. The barrister’s chamber is a place of contemplation and inspiration. The all-in-one-work-and-meeting-room. The space functions as a work and a meeting place, but also a place of respite. Where one can think creatively whilst preparing for the next case. 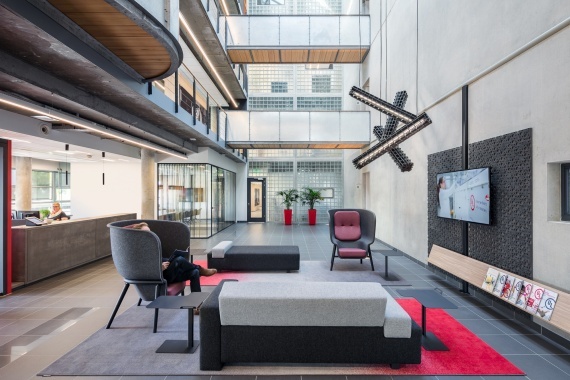 While drawing the first lines of the interior concept, it was obvious that sustainability was an important aspect for the new interior of ProRail's new traffic control post. 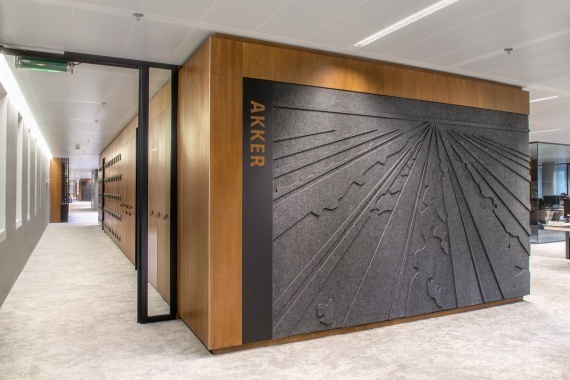 Architecture firm de Jong Gortemaker Algra was able to manage the interior that reflects the clients aim for a Circular Economy. 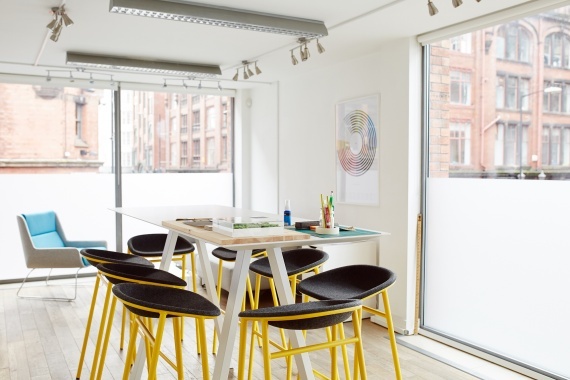 The LJ 3 stools for the Spacemen Creative group were supplied by Form, the Manchester based contemporary furniture consultancy. The appealing yellow coloured frames of the LJ 3 bar stools make these stools stand out in this bright and vivid athmosphere. The WTC building in The Hague is like "a stage being set". The outdated rooms are now clear and modern offices ready and waiting for new company's to enter. De Vorm provided all the essential props to aid in the transformation from the old to the new. A fine example of how our Arnhem sofa can communicate with its space. 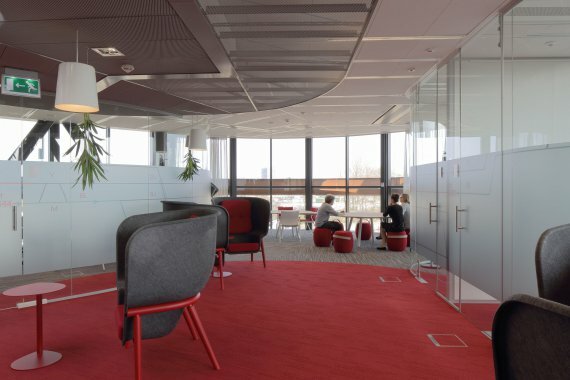 Rabobanks interior communicates with vivid reds and serene beiges to create two different scenarios. Our sofa's can either blend in or stand out. 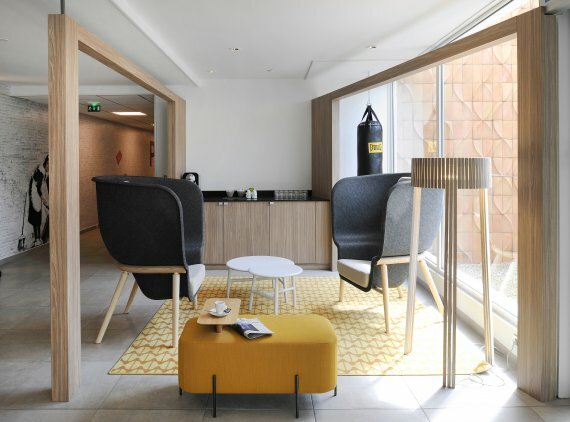 Your vacation has really begun when entering the Novotel reception area in Nancy. Take a load off in our Pod chair. The Pod chairs shielding and soundabsorbing shape is perfect for enabling intimacy, or simply to unwind and reconnect with your loved ones. Kings Cross is one of the most iconic stations in London. 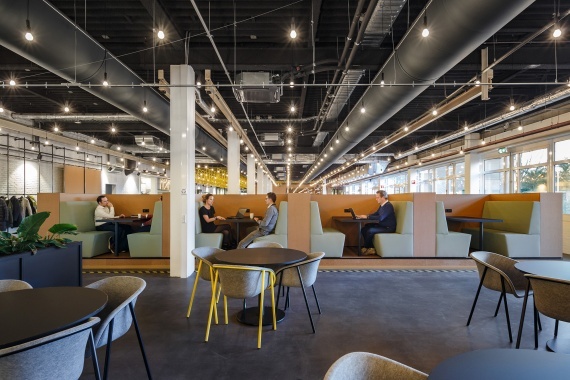 In this croudy place, The Office Group opened a thriving flexible office environment offering a place to work or to meet. Our Pod Chairs are located in the heart of the main hall, providing comfort and privacy for meetings on the road.